When thinking about tiling options for the kitchen, powder room, guest bathroom, and master bathroom we knew we wanted something simple and classic that would (hopefully) withstand the test of time—I’m sure that’s what homeowners were thinking when they were installing pink toilets 50 years ago. This is a 100+ year-old house that’s undergone a lot of updating and it’s been all about balancing the old/history with the new. 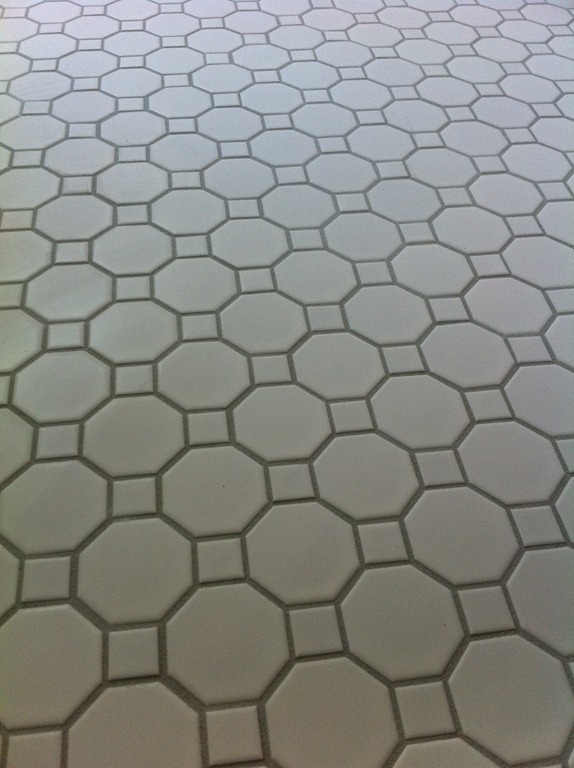 We spent hours upon hours online looking through photos of bathroom and then spent almost half a day at the tile store. Luckily, we had a terrific salesperson who was knowledgeable and helped find what we wanted within the budget. 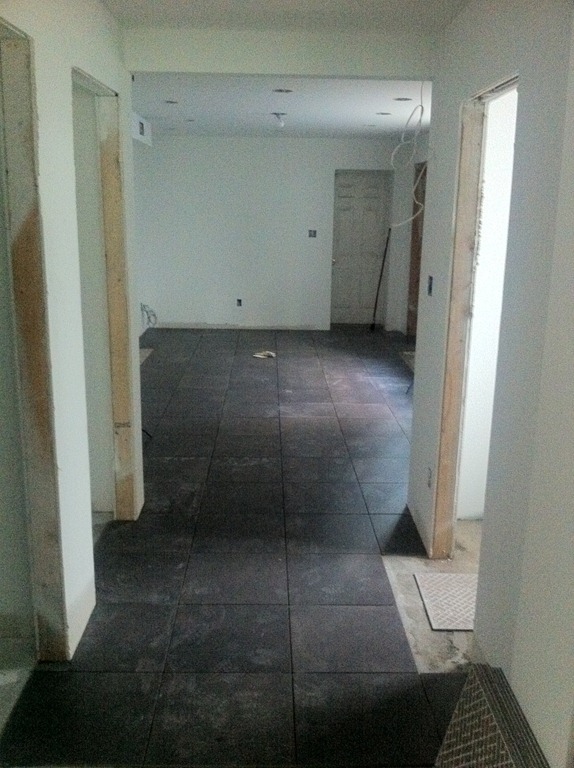 The pass-through and kitchen got an 18”x18” dark gray glazed porcelain tile (over heated floor matts to stay warm in the winter) that is reminiscent of cement (matching dark gray grout). It will ground the space and balance the high-gloss white modern kitchen cabinets. 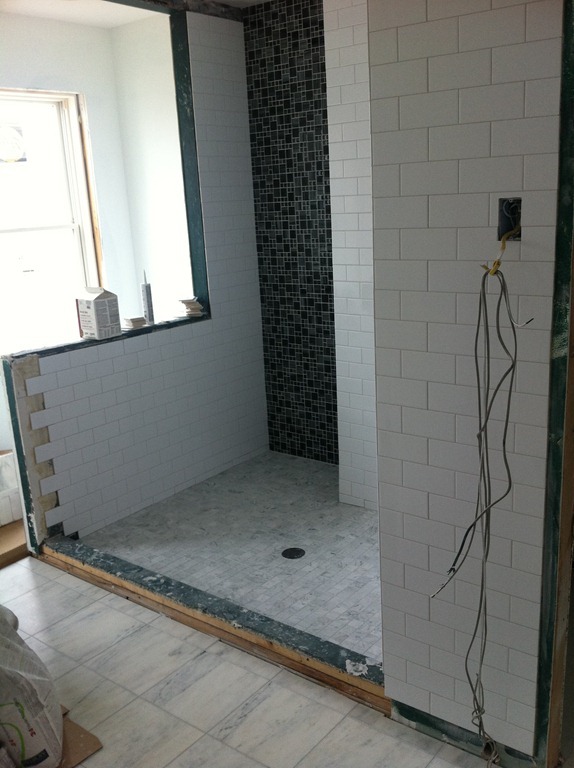 The powder room is a small 3’x6’ space – it has white Carrera marble tile in a basketweave mosaic pattern with block dots in a honed finish (dark gray grout). There’s a black threshold connecting the kitchen tile to it. 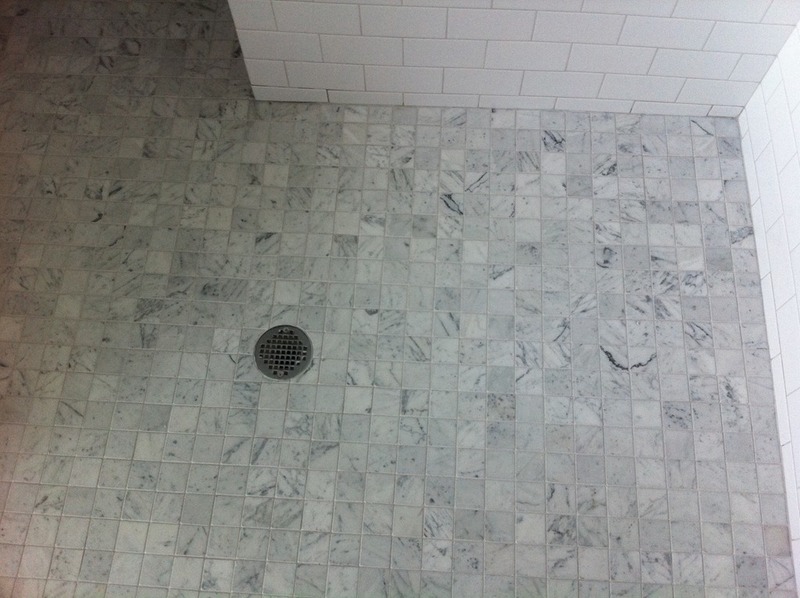 The guest bathroom floor has a 2”x2” octagon matt white tile with matt white squares (silverado grout) and 3”x6” ice white subway tile in the shower and sink wall (mist grout). 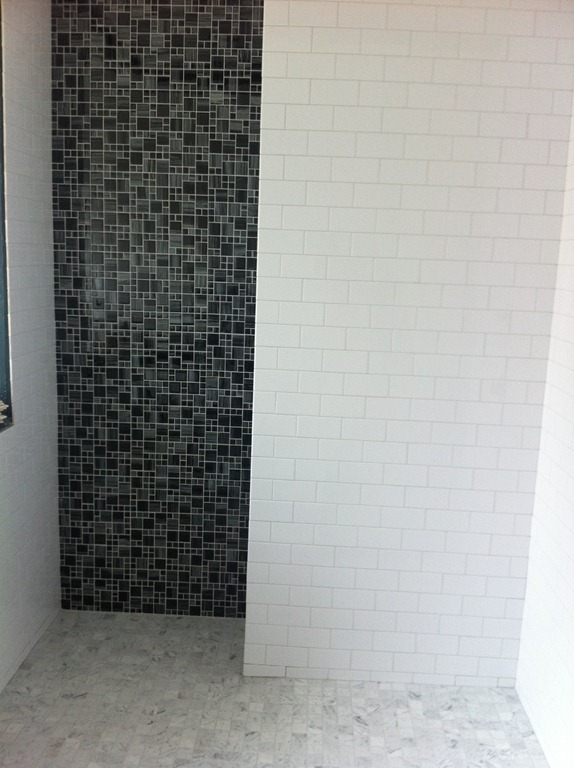 …3”x6” ice white subway tiles for the walls, and a “don’t hate it, but don’t love it” graphite glass tile on the accent wall in the steam shower (silverado grout throughout)—we were reassured that we can continue the white subway tiles over the glass tile if don’t love them after moving in, so we stuck with it. (Speaking of withstanding the test of time!) 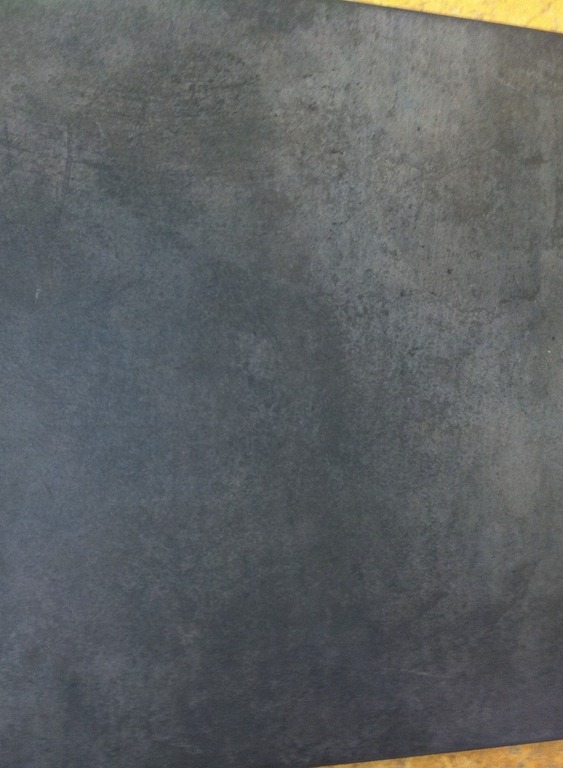 We’re planning a gray wall color to pull it out a little, but that’s a whole other post or series of posts. 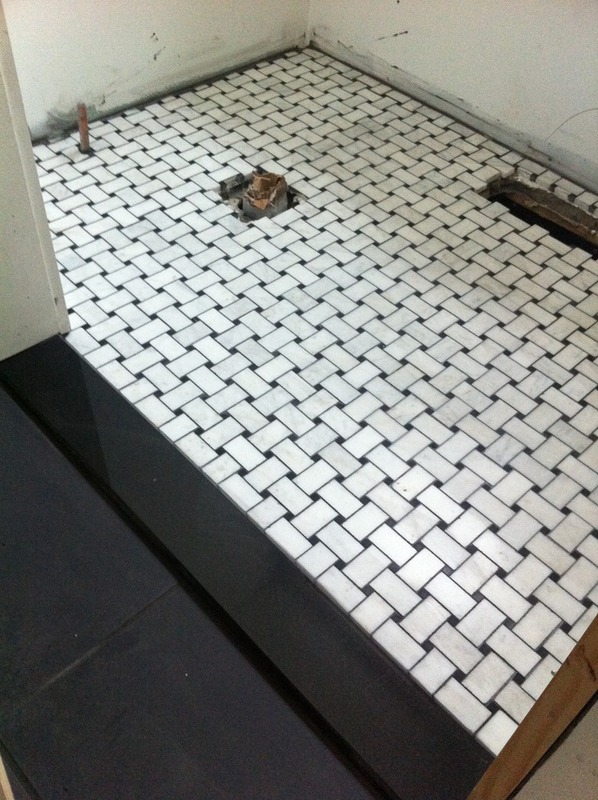 This entry was posted in Guest Bathroom, Kitchen, Master Bathroom, Pass-Through, Powder Room, Tiles. Bookmark the permalink. Hi! Your house is looking fabulous. 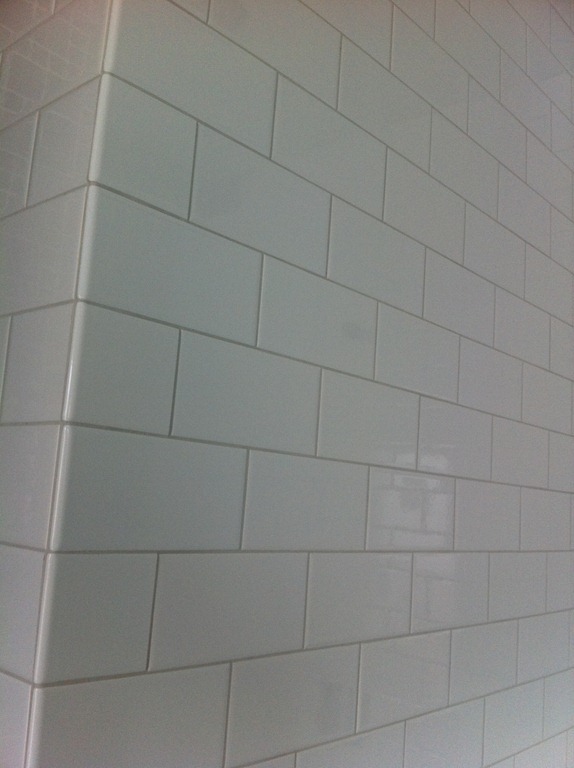 We are renovating our kitchen in a Brooklyn row home and I am considering subway tile. Which brand did you use? The color is ice white? Thanks so much! I’m not sure what brand of tile it was — it was one of a few basic tiles on display at Avalon Carpet and Tile which is a regional chain. Yes, the color was Ice White. A word of caution, which might be obvious… Not all whites match. 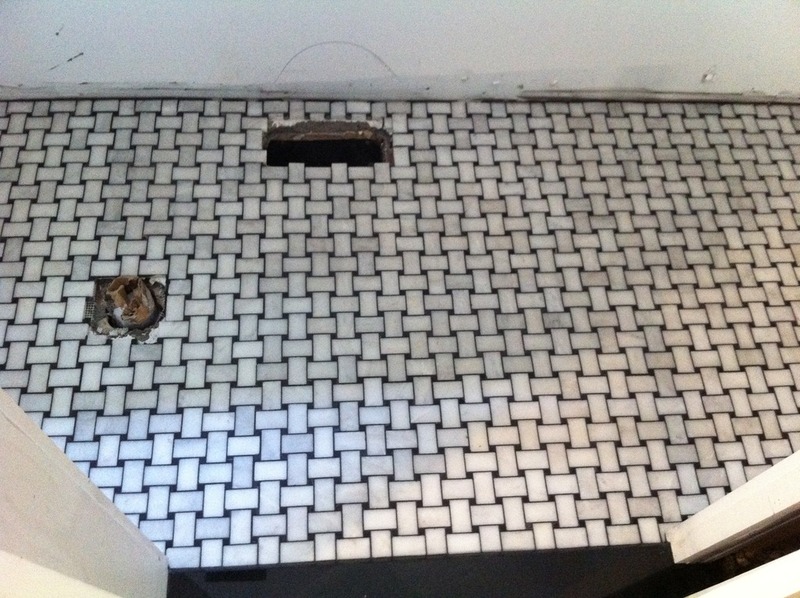 While we took care to match the whites of the toilet, tub and sinks, we didn’t overthink that when it came to tiles in the guest bathroom. 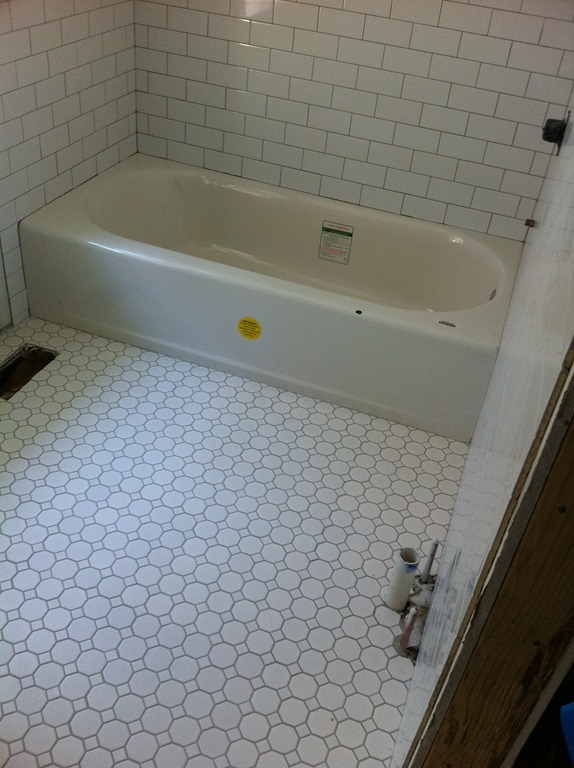 Shiny tiles on the walls; matt white on the floor for better traction; the toilet, tub and sink… we were able to balance it with the wall color. 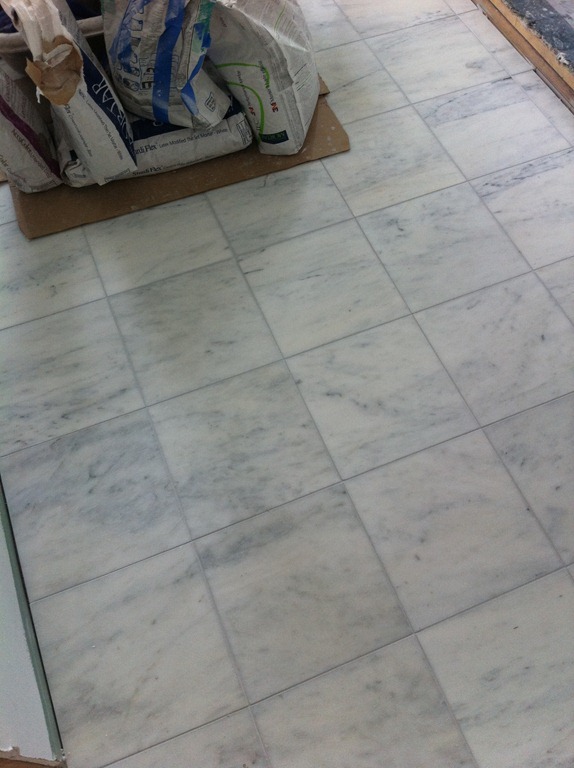 Fortunately, the master bathroom’s whites worked well with the marble floors. Have you pulled inspiration pictures for the look your’re trying to achieve? Very exciting! Good luck in your renovation. 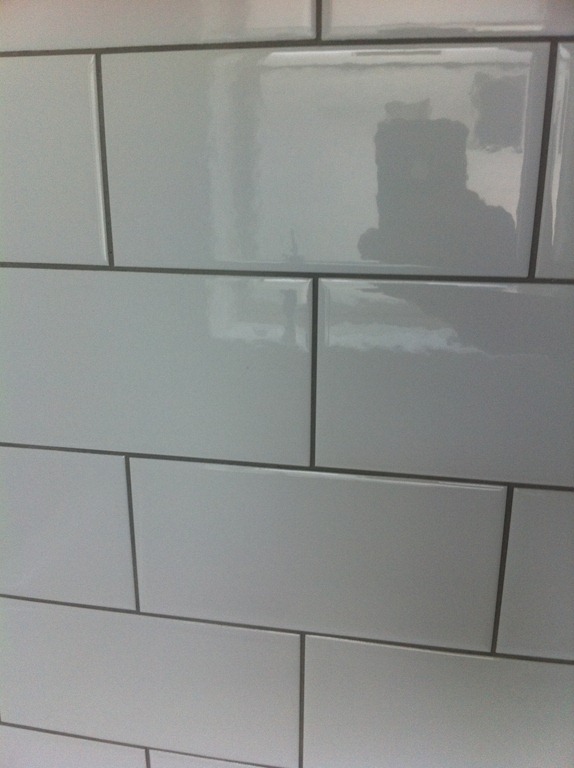 Any chance I can find out what tile your glazed gray is? It has lovely variation. Thank you. Thanks for stopping by. 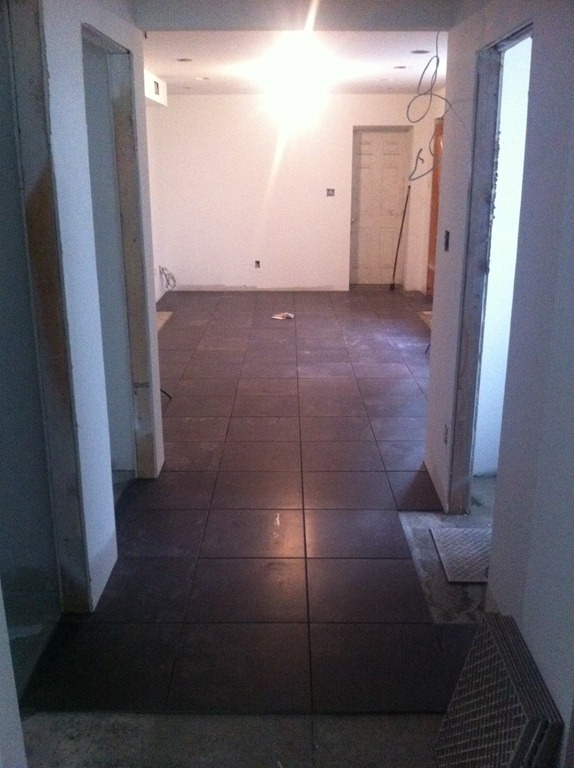 The gray kitchen tile is called “Emporio Nero” 18″ x 18″. It was purchased at Avalon Carpet and Tile, which is a regional chain. We still love the look and how well it has held up to daily wear and tear. A little challenging to clean and keep spotless, but not impossible.